LIMITLESS is a nicely executed sci-fi thriller but falls down on the screenwriters' inability to fully explore the ramifications and consequences of its initial conceit. For all that, a perfectly decent DVD-night film. THE HANGOVER's Bradley Cooper stars as Eddie Mora, a hapless novelist with a loyal but alienated girlfriend (Abbie Cornish). 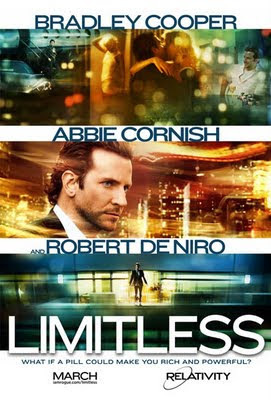 At his wits' end, he takes a dodgy pill called "Limitless" from his ex brother-in-law and suddenly has absolute focus and boundless energy. He writes an amazing novel in one day, gets a sharp new suit, and - obviously - this being Hollywood where greed is always manifested as greedy capitalism - he becomes a day-trader. His ability to make quick money gets him a job with legendary fund manager Carl Van Loon (Robert de Niro) and all goes well until the dodgy Russian mafiosi that staked him in the stock market comes looking for money. The final straw is when Eddie realises that he's running out of his precious drug. The movie start off with real energy and style. Cooper is convincing both as the self-pitying schlub and as the slick trader. Abbie Cornish is sympathetic as the girlfriend and Robert de Niro - well, he barely has to act to look scarily impressive. Behind the camera, I loved the way cinematographer Jo Willems (30 DAYS OF NIGHT, HARD CANDY) made subtle changes in lensing and film stock to show the difference between the ordinary world and the crisper, sharper world when on Limitless. But the movie really falls down on Leslie Dixon's (MRS DOUBTFIRE, LOOK WHO'S TALKING) script. I loved Carl Van Loon's big speech where he talks about having to earn rewards - but that isn't played out in the endgame for Eddie Mora. Not at all. And one can't help wonder how a darker, more daring director like David Fincher would've treated the material during the black-out. LIMITLESS is on release in the US, Belarus, Bosnia, Israel, Kazakhstan, Russia, Canada, Turkey, the US, Philippines, the UK, Croatia, the Czech Republic, Slovenia, Brazil and Bulgaria. It opens in April in Greece, Kuwait, Poland, Armenia, Belgium, Hong Kong, Hungary, the Netherlands, Singapore, Finland, Spain, Taiwan, Germany, Italy, Denmark, Mexico, Portugal, India and Sweden. It opens on May 24th in Indonesia. It opens in June in Lithuania, Norway, Colombia, Estonia and Peru.